Visiting Durant Nature Preserve is an opportunity for people in the bustling cities of Raleigh and Wake Forest to connect with nature. This nature preserve stretches over 237 acres. There are eight trails throughout the preserve that are accessible to hikers, three of which allow mountain biking. The trails available to mountain bikers are Border Trail, on the perimeter of the preserve, White House Road and Beaver Pond Trail. The Border Trail is accessible from Campbell Lodge at the South Entrance of the preserve. White House Road is accessible from the North Entrance on Camp Durant Road. Beaver Pond Trail is accessible from the Border and White House Trails. Secret Creek Trail is a well kept secret of the park. This trail begins to the left of the playground hidden in trees. The trail is approximately one mile out and back. It's a scenic beginner hike that is great for children. The creek that neighbors the trail provides an opportunity to see some wildlife, enjoy the calming flow of water, and splash around when it gets hot outside. Durant Nature Preserve contains several parks, including a bird park and butterfly park, as well as a playground for children. There are several covered and uncovered picnic areas for visitors to use, some can be reserved while others are first come first served. A sand volleyball court is also available for use. The two Camp Durant lakes allow fishing year round. North Carolina fishing regulations apply. Durant Nature Preserve has achieved a great accomplishment in providing a place for outdoor enthusiasts to escape to nature. Residents of Raleigh and Wake Forest have been given the opportunity to experience adventures or find peace in nature in this sanctuary. 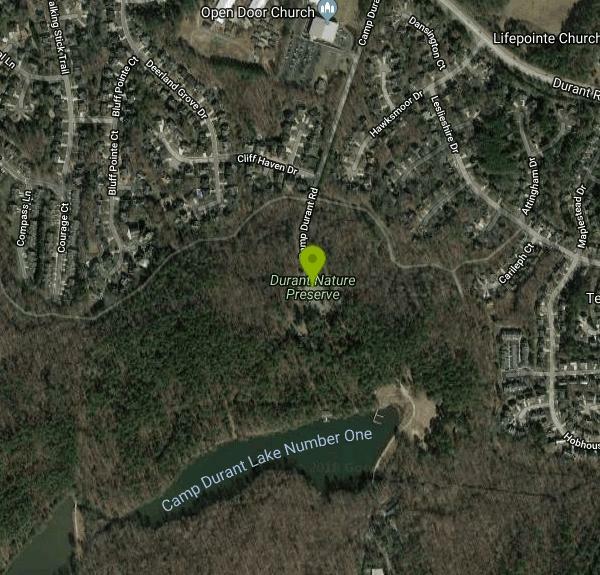 As a long time resident of North Raleigh I have spent many a weekend in this Durant Nature preserve. It is a place I have never wanted to leave. Going bass fishing never lost its intrigue, because even on the days I couldn't catch a fish I could stare at the sky in the lake. Secret Creek Trail is one of my favorite places to visit. I enjoy the quiet of this well kept secret. I always take a break from my hike and enjoy wading and splashing in the shallow creek with my family and friends. Durant Nature Preserve has been a place for me to reconnect with the people and beauty I miss in my every day life.